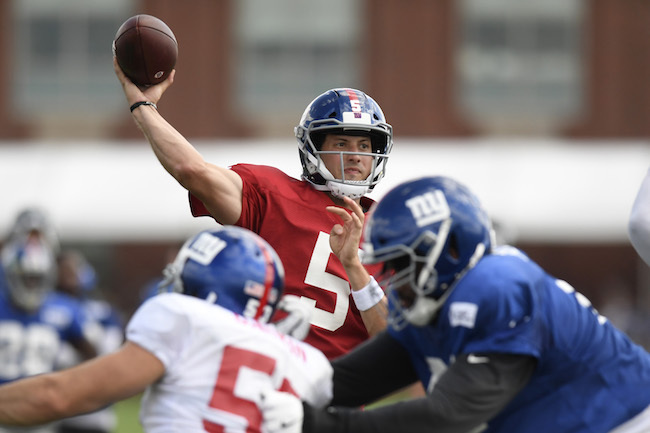 While the last official training camp practice for the New York Giants was held on August 7th, the team is holding joint public practices with the Detroit Lions on August 14-16. Not practicing on Wednesday due to injury were wide running back Saquon Barkley (hamstring), receiver Travis Rudolph (quad), tight end Ryan O’Malley (ankle), defensive end R.J. McIntosh (unknown – Active/Non-Football Illness list), linebacker Connor Barwin (“soreness”), linebacker Thurston Armbrister (hamstring), cornerback Donte Deayon (hamstring), and safety Darian Thompson (hamstring). Curtis Riley remained the starting free safety. In 7-on-7 drills, wide receiver Cody Latimer made a leaping catch over cornerback Darius Slay in the corner of the end zone for a touchdown. Wide receiver Hunter Sharp made a “spectacular” leaping catch in the back of the end zone for a touchdown. Quarterback Davis Webb threw a precise pass in the end zone to tight end Scott Simonson for a touchdown. Quarterback Kyle Lauletta threw a dart to wide receiver Roger Lewis, Jr. for a score. Off a rollout, quarterback Eli Manning threw to wide receiver Odell Beckham, Jr. in the back of the end zone for a touchdown. 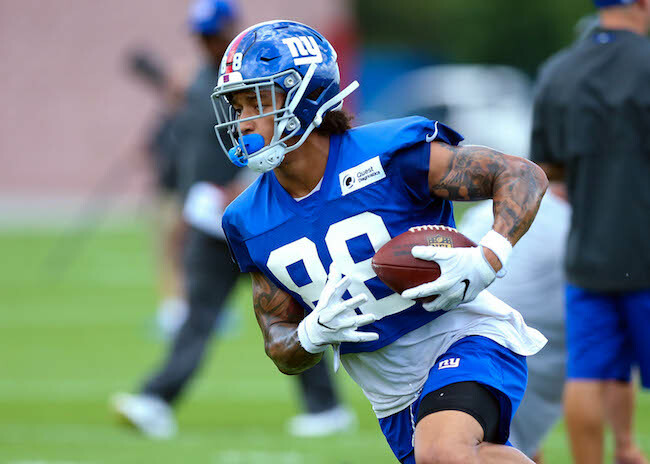 In 7-on-7 drills, tight end Evan Engram made a very nice catch of a quarterback Eli Manning pass that was thrown low and behind of him. Quarterback Eli Manning fired a pass between two defenders to wide receiver Hunter Sharp who made a nice catch for a touchdown. Quarterback Davis Webb hit wide receiver Roger Lewis, Jr. in the corner of the end zone for a touchdown. Webb then threw a nice back-shoulder pass to tight end Rhett Ellison for another score. Ellison had three scores in red zone drills. In 11-on-11 redzone drills, linebacker Olivier Vernon blew through the line of scrimmage and nailed the back for a 3-yard loss. Vernon had at least two “sacks” and another tackle for a loss during drills. Defensive end B.J. Hill “sacked” the quarterback and defensive end Dalvin Tomlinson made a couple of plays in the backfield. Nose tackle Robert Thomas continues to impress, flashing throughout practice. 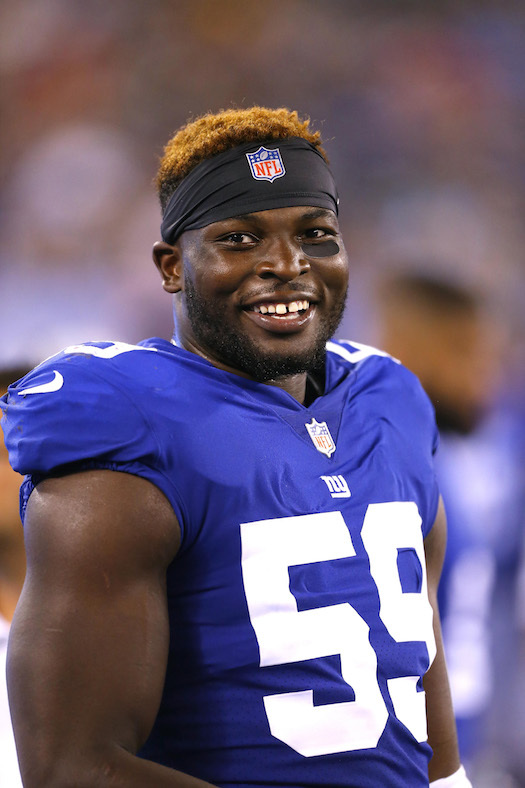 Defensive end Ziggy Ansah badly beat right tackle Ereck Flowers on a pass rush, leading to a “sack” by former Giant linebacker Devon Kennard. Wide receiver Sterling Shepard drew a pass interference penalty. Then quarterback Eli Manning hit tight end Evan Engram for a touchdown against safety Glover Quin. In 11-on-11 drills, quarterback Davis Webb rolled out and threw a touchdown pass off his back foot. Linebacker Lorenzo Carter “sacked” the quarterback in redzone drills. He gave left tackle Tyrell Crosby problems. Linebacker Alec Ogletree was having problems covering Detroit’s tight ends. Hakeem Valles and Levine Toilolo both scored against him. Ogletree did pick up one “sack” and a tackle for a loss during 11-on-11 drills. Wide receiver Chris Lacy made a leaping catch over cornerback Eli Apple in the back of the endzone for a touchdown. In the 2-minute drill, after committing a pass interference penalty, cornerback Eli Apple picked off a pass from quarterback Jake Rudock intended for wide receiver Marvin Jones and returned it for a touchdown. In 2-point conversion attempts, the Lions were 3-for-3 while the Giants were 0-for-3. The Giants will practice against the Detroit Lions in Michigan on Thursday (open to public). The two teams face off on Friday night at Ford Field. Not practicing on Tuesday due to injury were wide running back Saquon Barkley (hamstring), receiver Travis Rudolph (quad), tight end Ryan O’Malley (ankle), defensive end R.J. McIntosh (unknown – Active/Non-Football Illness list), linebacker Connor Barwin (“soreness”), linebacker Thurston Armbrister (hamstring), cornerback Donte Deayon (hamstring), and safety Darian Thompson (hamstring). Curtis Riley remained the first-team free safety. Quarterback Eli Manning connected on a deep ball with wide receiver Odell Beckham, Jr., who blew past Lions’ cornerback Chris Jones. 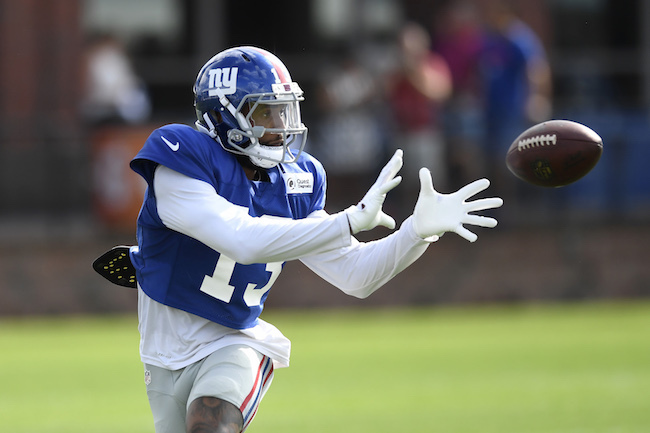 Wide receiver Odell Beckham, Jr. made a sharp cut against Lions’ cornerback Darius Slay for a catch over the middle. Beckham later beat Slay again in 7-on-7 drills and scored. Quarterback Davis Webb badly overthrew wideout Hunter Sharp in the flat. Running back Wayne Gallman burst through the line, made a nice cut, and got to the second level of the defense. Left guard Will Hernandez had a nice block on defensive end Ziggy Ansah on the play. Cornerback B.W. Webb and wide receiver Kalif Raymond did a nice job as gunners on punt returns. Quarterback Eli Manning overthrew wideout Cody Latimer in the end zone. Latimer made a one-handed catch by was ruled out of bounds. Linebackers Olivier Vernon and Avery Moss were the Giants’ most disruptive pass rushers. Defensive linemen Robert Thomas and B.J. Hill flashed. The Giants’ offensive line did a good job of keeping the quarterbacks clean throughout practice. 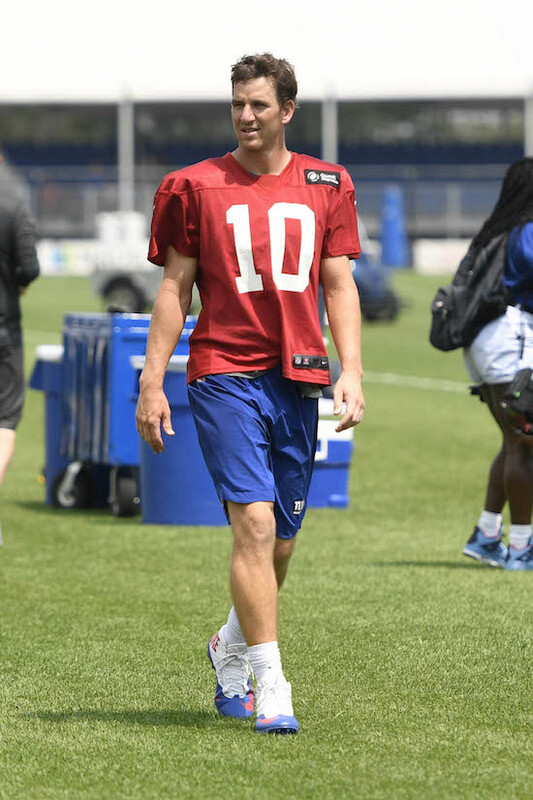 In 7-on-7 redzone drills, quarterback Eli Manning was 4-of-5 with three touchdowns. 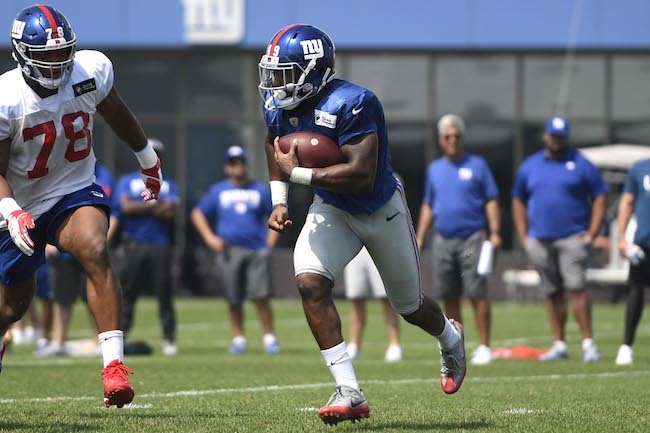 In 11-on-11 drills, quarterback Eli Manning stepped up into the pocket and fired a pass to wide receiver Sterling Shepard over the middle on a post pattern. Manning finished 5-of-5 to five different receivers in this team drill. In 2-minute drills, cornerback Eli Apple leapt up and knocked away a pass intended for wide receiver Marvin Jones in the end zone. But then quarterback Matthew Stafford found Jones for a touchdown against Apple and over safety Landon Collins. In 2-minute drills, wide receiver Odell Beckham, Jr. made a leaping catch over corner back Nevin Lawson. But then the Giants’ possession ended with quarterback Eli Manning being intercepted by safety Glover Quinn. The Giants will practice against the Detroit Lions in Michigan on Wednesday and Thursday (open to public). 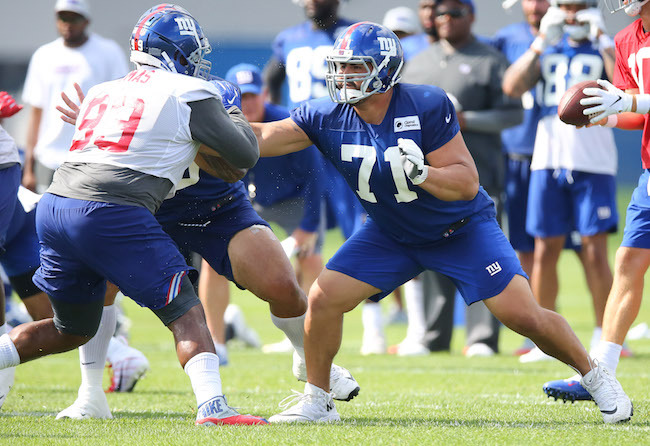 The New York Giants held their tenth full-team summer training camp practice on Monday at Quest Diagnostics Training Center in East Rutherford, New Jersey. The complete training camp schedule is available at Giants.com. 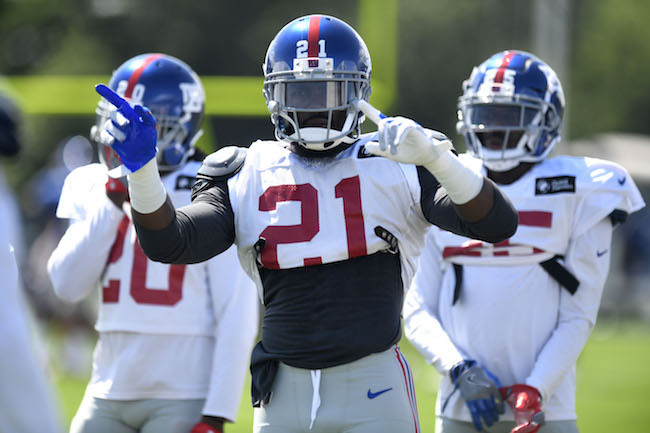 The New York Giants have issued their first depth chart of the 2018 season. For details, see the Depth Chart section of the website. The New York Giants have terminated the contract of cornerback Teddy Williams. The NFL Network is reporting that Williams, who has been away from the team for the last few days while dealing with a family health issue, had asked the team to release him so he can adequately focus his attention on the issue. Williams reportedly would still like to play for the Giants but he does not want to take up a roster spot. 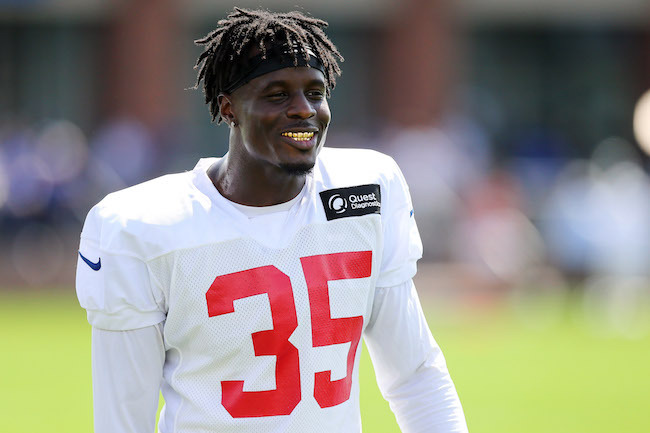 The Giants signed Williams in March 2018 after he was cut by the Carolina Panthers. The 6’1”, 210-pound Williams did not play college football and was originally signed by the Dallas Cowboys in 2010. He has spent time with the Cowboys (2010-2011), Sacramento Mountain Lions (2012), Indianapolis Colts (2012), Arizona Cardinals (2013–2014), Chicago Bears (2014), Jacksonville Jaguars (2014), and Carolina Panthers (2015–2017). Williams has played in 36 regular-season games with no starts. He spent most of the 2016 season and all of the 2017 season on Injured Reserve with knee and shoulder injuries, respectively. Not practicing on Monday were wide receiver Sterling Shepard (maintenance day? ), wide receiver Travis Rudolph (unknown), tight end Ryan O’Malley (unknown), cornerback Donte Deayon (hamstring), cornerback William Gay (hamstring), linebacker Thurston Armbrister (hamstring), and defensive lineman R.J. McIntosh (unknown – Active/Non-Football Illness list). Darian Thompson and Curtis Riley received first-team reps at free safety. With Sterling Shepard sitting out, Kalif Raymond received the bulk of his first-team snaps at wide receiver. Wide receiver Kalif Raymond scored on a jet sweep, beating linebacker Lorenzo Carter to the pylon. Safety Sean Chandler picked off an errant pass from quarterback Kyle Lauletta. At one point in practice, the second-team offensive line was left tackle Chad Wheeler, left guard Brett Jones, center John Greco, right guard Chris Scott, and right tackle John Jerry. Running back Saquon Barkley broke off a big gain on a screen pass. Quarterback Eli Manning found tight end Rhett Ellison for a touchdown over the middle. Manning and Ellison also connected on a big gain between linebacker Olivier Vernon and safety Landon Collins. Cornerback B.W. Webb intercepted quarterback Alex Tanney. Recently-signed cornerback Leonard Johnson received some first-team snaps in the nickel defense as the slot corner. Linebacker Avery Moss flashed during 1-on-1 pass rushing drills. 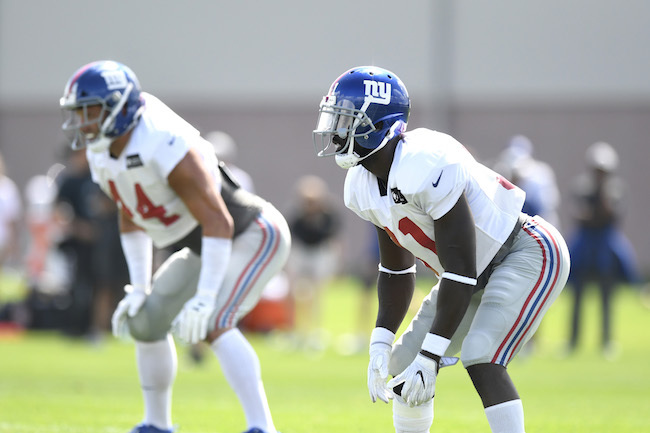 Olivier Vernon has had a very strong camp and the Giants are using him at both outside linebacker spots. Wide receiver Odell Beckham, Jr. beat cornerback Janoris Jenkins deep on a post route, but quarterback Eli Manning overthrew Beckham. Place kicker Aldrick Rosas made all of his kicks, including one from 50+ yards out.